We had all begun to worry now about how far ahead HoN Co. might be from us... We hadn't said much since when we had rested, and it was beginning to show that we felt slightly defeated at the loss of one of the Eyes of Ender. It wasn't the end of the world, but we definitely weren't working to our maximum capacity that we could do. We had two of the Eyes so far, which was still much much better than nothing at all. We had at least pushed both sides to a stalemate until one of us decided on a plan to find and take the ones they didn't have from the others. HoN Co. had one of the Eyes, we had two, so we would need to plan at least one retrieval mission to take the Eye back with us to Minecraftia. Then again there were still two Eyes left to take. Let's just hoped that HoN Co. didn't get any more, otherwise they might get the same idea as us and hide them in separate places. "What if it wasn't HoN Co. though...? 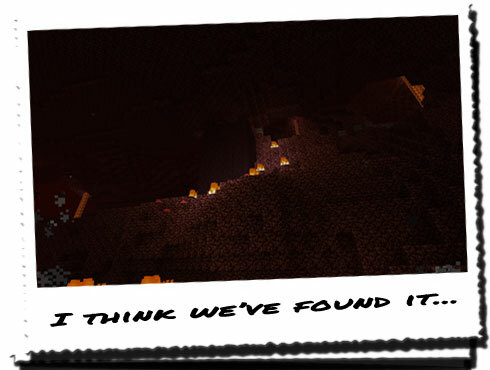 What if there was no Eye of Ender, or if that one that was supposed to be there is already in the portal?" "I don't think it'd be that... There's no-one else looking for the Eyes besides us and HoN Co. - not that I know of - and if it was one of the Eyes of Ender that was already part of the portal, why had HoN Co. marked it on the map? Presumably they were the ones who found the first seven..."
"Yeah, but we don't know that... It could have been someone or something else... Long ago... It's not entirely impossible." "True, but whoever or whatever did that has saved us a lot of work in the long run. With us possessing two of them, with two left to be found and HoN Co. possessing one, we've got the right number to activate the portal." We continued following THEROS, who had deviated off the due South path slightly, and was now heading ever so slightly East. Asking to borrow the map, THEROS produced it from his bag and pointed to where we were instantly, before passing it back to me. From the previous location, from where we were and the slight angle bent towards the East we were heading in, I guessed that we were on a pretty accurate path to the next place. Passing the map back, I began to take in the scenery and try to get away from the slight depression that had seemed to drape itself over us since losing the third Eye to HoN Co.... We had managed to more or less maintain our vertical positioning, mainly travelling along a flat pathway that only had a few bumps and hills. We had come to the occasional obstruction where we had to deviate slightly from our path to get around it. We came to another, and once we manoeuvred around it, we stopped and looked up. A large hill stood before us, with small fires burning away throwing meagre amounts of light around. 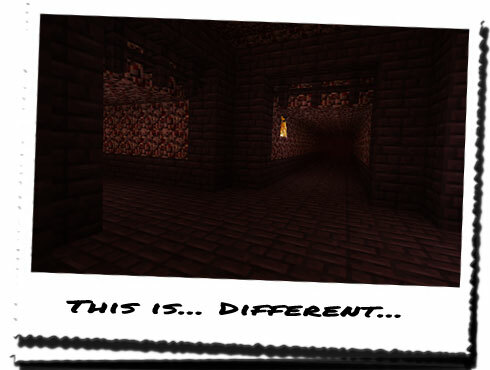 In this light, we could just make out the distinctive dark purple-red colour of the Nether stone bricks. We had found it! And no sign of HoN Co. guards either! "Is this it...? Don't get me wrong, it definitely looks like it is, but aren't bridges meant to go over stuff...? Like lava? Not through massive walls..."
"Well it's obviously more of a tunnel then." "No... A tunnel would suggest the entire structure would be encased in the same bricks, but this is just a walkway extending into a large, long hollowed out section of wall... made from a separate material..."
"Does it matter all that much? We've found what we were looking for, so be happy with that." Wrapping up the bizarrely pointless conversation, THEROS led the way down the enclosed tunnel; it seemed to go on forever, but there was no need to light any of it. Oddly enough there were a few fires already burning away in the walls were the Nether stone had been chipped out. They provided more than enough light to see by, but the whole experience of being on a bridge whilst being enclosed was a little strange, I had to admit. The bridge / tunnel was immensely long, much longer than any of the others we had encountered before, but it was lit sufficiently the entire way through. We eventually came to a crossroads where we had expected the structure to open out a little more, but instead each direction would take us even further into a massive hollowed out structure. "Which path do we take now? I somehow doubt your 'take the straight ahead path' rule is going to work here..."
"No, that was for when we had identified the entrance to the main structure from the lava well. And besides, it's more of a guideline than a rule. With his I suggest we start with the simplest and most logical operation: start left and work our way around." "Fair enough, but how are we going to identify which paths we've taken and which we have left? Torches aren't going to help us here..."
"We'll get to that hurdle when we have to hop over it..."
THEROS led the way once again, taking the left path hoping we would find some way to indicate which paths remained unknown to us. From the silence that followed, I could tell that both THEROS and THEXIS were hoping that we got to the Eye of Ender before the HoN Co. guard team... So did I.